The classic BoozerBeam™ is made of the finest materials available. Each is built with the dedicated skill of our craftsmen and quality inspected by the American Institute of Timber Construction (AITC). We feel the beauty strength and durability of a BoozerBeam™ is unequaled by any other engineered wood product. Made of the finest southern yellow pine lumber and waterproof adhesive available. Quality inspected by the American Institute of Timber Construction (AITC). Pound-for-pound stronger than steel I-beams. Available in architectural appearance grade for visually exposed applications. Absolutely beautiful! Less expensive than LVL & PSL. Exceptional value in cost vs. performance. Cambered to offset dead load deflection (optional). Individually wrapped with water resistant paper. Available in any length up to 52′. 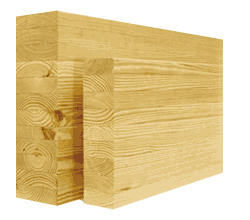 6 3/4″ and 7″ and depths that are compatible with I-joists, conventional framing and traditional glulam.